The offerings of various players in the online travel space are largely undifferentiated, with price playing a crucial role in consumer selection of an online site. However, marketing research techniques can throw up interesting findings that have implications for creating differentiated offerings. This article explores the usage of marketing research for generation of product concepts. A structured approach is followed with: problem definition, exploratory research, sampling design and quantitative analysis (descriptive research) phases. The article deals with research and analysis about consumer perception about online travel sites, key factors that influence their choice and usage, and consumer expectations with respect to booking their travel online. On basis of research findings, recommendations regarding product concepts and features are given. 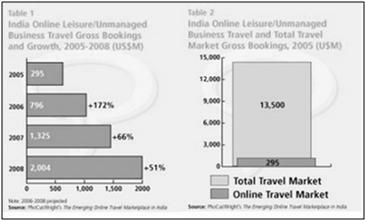 The OTA (online travel agency) business in India is currently expected to be approximately $800 million and depends largely on air travel-related transactions (2008). With growth clocking around 50%, India will soon be placed among the top ten markets for internet air bookings. The market space is quite cluttered, with a range of both established companies and start-ups providing undifferentiated offerings. Seemingly, price has played the predominant role in customers' choice of service provider. Given this context, this article aims to show that systematic marketing research can be deployed for development of new product concepts, which would provide a platform of differentiation to a new entrant in this otherwise-commoditized space. The first step of marketing research is Problem definition. In this case, the start-up firm wants to come up with a differentiated Product offering (Concept) in Online Travel Agency space. Hence, this becomes the Management Decision problem. From this, specific objectives of Marketing Research are determined. The study involved both exploratory and descriptive research techniques using both primary and secondary sources. Secondary research provided insights regarding Industry trends, Offerings of key players and Consumer Profile and preferences; Focus Group discussions and Depth Interviews provided information about Consumer perception about the Product/Service offering, Key factors that influence their choice, Satisfaction levels with current offerings, and desirable features. We also used the following descriptive research techniques - Hypotheses Testing to validate certain findings that came up during exploratory research; Factor Analysis to determine key criteria used by consumers to choose on OTA offering; Cluster Analysis to determine major consumer segments and demographic & behavioural profiles, Perceptual Mapping to determine perceived differences among offerings of different OTA players, and Conjoint Analysis to identify product concept(s) that are desirable for users. For each of the Research Problem, Research questions (RQ) were developed; and for each Research question, certain Hypotheses (H) was postulated. These hypotheses would be tested for using survey responses. 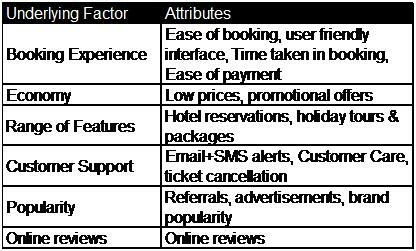 RQ1: What are the major segments among Online Travel Site users? RQ1: Do consumers find significant differences in offerings of various OTA sites? RQ1: Do consumers use OTA sites more for information purposes only (e.g. price comparison) rather than booking tickets? RQ2: Is ease-of-use of website an important criterion for consumers to choose an OTA site? RQ3: Do barriers (such as User Registration) exist for switching between OTA sites? RP4: To identify which features of product/service offering are preferred and to determine satisfaction levels of consumers with the current offerings. RQ1: Is human interface-based customer care essential for building trust among consumers? RQ2: Is security of payment (through credit/debit cards) a major satisfaction-related issue for consumers of OTA sites? RQ3: Are the ratings of hotels available on OTA sites (for holiday bookings) found reliable by consumers? RQ4: Is the range of hotels available on OTA sites found adequate by consumers? The Online Travel Agency business in India is estimated to be approx. $800 million. The market size grew at 51% for the year 2007-08 with Online Travel comprising just around 7% of the total travel industry. The key players in OTA are makemytrip, cleartrip, yatra, travelguru and, ixigo. The high growth rate has also attracted international players like expedia and travelocity. However, revenue-wise, makemytrip.com was the market leader with $360 million in revenue in 2007-2008 followed by cleartrip.com which had $200 million in revenue. Yatra.com was third with $150 million in revenue, with the other players sharing the rest of the pie. The Focus Group Discussions and Depth Interviews gave key insights into the consumer behaviour. OTAs were found useful for convenience in planning trips beforehand to avoid major unforeseen expenditures by comparing prices across various sites. The research helped identify the problems faced in booking through travel sites like issues of coverage, accessibility of internet, reliability of transactions, technical issues with the site as well as lack of human interface in case of problems. It was found that there was no major differentiation factor among the Indian sites and the criterion for selection of site was heavily based on price; secondary factors being availability, range of coverage, range of airlines and convenience basis or commission charged by the site. Additional incentives like price-cuts and credit card discounts are also somewhat significant for selection of the site. Past experience also plays a role in site selection. It was found that the customers desired a Human interface-based customer service and other support services for more reliability. They also desired extensive coverage of airlines with greater options. All questions (except identification-based) were closed-ended. The basic questions were posed first, and identification questions were at the end. Careful wording was used to avoid ambiguity or biasing questions. Several questions involved the respondent expressing his/her level of agreement with a certain issue. Few of these questions were stated positively and few others negatively to avoid biasing in response. Sensitive information such as Information regarding Income/Family Status had response categories and was placed towards the end of the questionnaire to increase response rate. The questionnaire initially developed was pre-tested by administering to a small number of respondents, and using debriefing to get their feedback regarding any problems encountered while answering the questionnaire. Internet users in the Age group of 20-50, who have used Online Travel site(s) at least once, were targeted. In this phase, techniques such as Factor Analysis, Cluster Analysis, Multi-dimensional scaling and Conjoint Analysis were used. 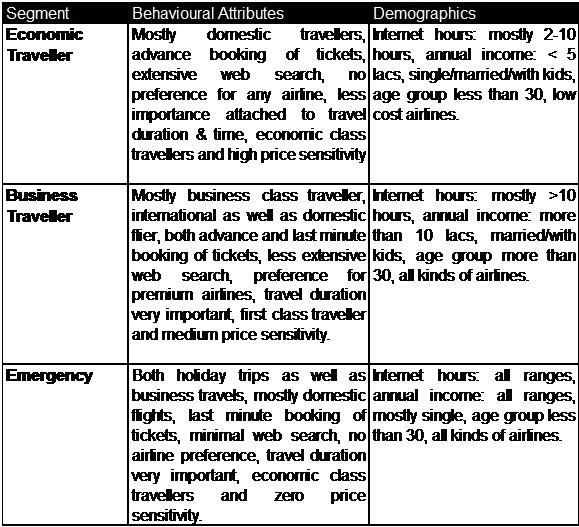 Based on ratings given by respondents to existing travel websites on 14 attributes, multi-dimensional scaling was performed. Based on it, a perceptual map of existing players, depicting consumers' perception of each player, emerged. The interpretation of the two dimensions of this map is largely on the judgement of the researcher. 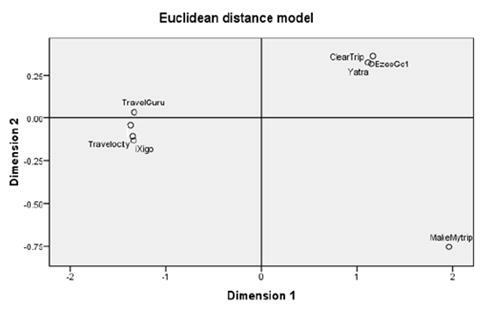 For instance, Cleartrip and Yatra are perceived as similar; whereas, MakeMyTrip is perceived as different from the other sites. Based on the analysis of information gathered and inferences made thereof, some recommendations were proposed to the start-up to increase market share. Customer Care: Easy and quick access to customer care acts as a re-assuring factor and increases customer satisfaction with service offering. The company should look at providing multiple channels of customer care, though the focus should be on customer care over phone, as revealed through data analysis. Usability: Usability of site is an important criterion affecting choice of an OTA site. The start-up firm should not just create a user-friendly interface, but streamline the process of booking tickets by creating a simple 2-step process. Through this, it should be ensured that the time for a typical booking is around 5 mins. Information Content/Reviews: Consumers do not trust the hotel ratings available on an OTA site as the perception seems to be that these might be subjected to bias. Hence ratings and reviews of Users and 3rd party should be included on the website to increase credibility. End-to-End Service: Users are increasingly asking for door-to-door service and wide range of features such as cab pickups and special care at airports. By providing the complete package, the company can create differentiated offering and thus charge a small premium. Mobile Booking: Considering that mobile penetration is growing at a faster rate than Internet penetration, this mode of sale should not be ignored. Tap into Referrals: Referrals seem to play a significant role in consumer choice process. Use of network marketing & word-of-mouth advertising is recommended. New product development involves Marketing Research in each of its phases: Concept Generation, Concept Testing, Product Testing, and Test Marketing. Given the restrictions involved in an academic project, this project dealt only with the Concept Generation phase. Also, given the restrictions in choosing an appropriate sample and conducting a survey thereof, the results of this study may not be totally generalized. Thus, this article demonstrates how systematic Marketing Research can be used for product development even in the online space. Combination of both exploratory and conclusive research techniques is generally required for drawing meaningful inferences from analyses. If the right technique is used, Marketing Research can prove to be a powerful tool in hands of the business decision-makers.